Please click here for more information about course accreditation. The Dog Behaviour Practitioner Diploma Course will teach you how to understand dog attitude and manage eventual mood swings. In addition, you will discover the secrets of influencing canine behaviour by the power of word, as well as by practical examples. The successful completion of this course will provide access to enrol in our Advanced Diploma Canine Behaviour Management Level 6 course. If you have not undertaken a level 5 course, you will need to provide proof of having covered the necessary study material in another course or through an alternative qualification opportunity. This module takes an in-depth look at the anatomy of the brain and how this can affect and shape behaviour. In the second module, you will discover the role of genetics and part it can play in influencing how a dog thinks and reacts to stimuli. Evolution, as a factor in genetics, will also be studied. The dominance myth is another part of the module’s curriculum. The module will focus on the elements that influence the way dogs behave. Aggression, stress, obsessions, frustration, fear, and anxiety will be the main topics. 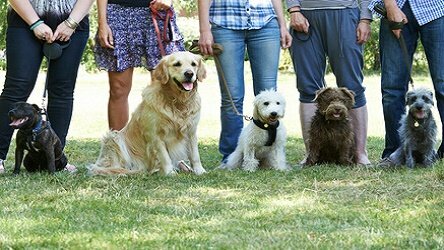 Unlike in other, lower-level courses, we will also put a strong emphasis on the way these conditions affect the dog owner, leading to changes in the relationship with the dog. Food and diet can negatively impact canine behaviour. As a behavioural practitioner, you need to understand the role diet plays and the relationship between nutrition, exercise and behaviour. The module will help you understand body language the way dogs express their emotional and physical state. In addition, human body language and its impact on canine behaviour is also a part of the curriculum. At this stage, we put a strong emphasis on the scientific discoveries related to a dog’s behavioural repertoire. We also take a look at the proven methods of training techniques. All methods are force free and relationship centred. Here, we will examine how owners and behaviourists can help solve canine emotional issues. No Pain. No Force. No Fear.